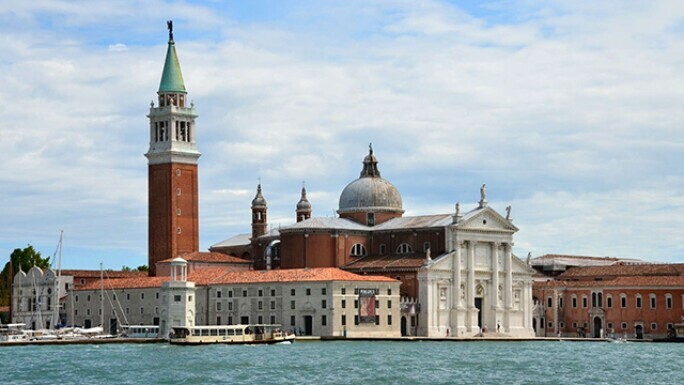 San Giorgio Maggiore returns Venice's gaze across the waters of the Grand Canal. The 15th century church, on a small island of the same name, has long been a fascination of Venetian old masters. The landscapes of the Venetian School - from Canaletto to Bellini - frequently depicted the distinctive façade of San Giorgio Maggiore; alternatively, artists would often cross the canal to paint on the church’s grounds, sketching the seminal bell tower and cathedral of Piazza San Marco on the other side of the waterway that, over time, became a point of cultural exchange and a liminal zone between east and west. View of the island of San Giorgio Maggiore from Venice. Indeed, from the shores of this island outpost, Venice turned to face the world. The eastern-facing port city was an active commercial hub for centuries, connecting the Ottoman Empire with city states of early Europe. Here, Venice witnessed the arrival of new goods, luxury commodities, and trade ware via Constantinople and the Silk Road; and with it, an unprecedented influx of artistic practices and aesthetic styles from cultural hubs as far east as present day Iran. In effect, San Giorgio Maggiore came to be understood as a place of connection, exchange, and dialogue between the heart of Venice and all that lay beyond. View of the island of Venice from San Giorgio Maggiore. Image courtesy of artist. Centuries after the height of old master painting was realized on San Giorgio, an alternate form of aesthetic and cultural exchange is on display inside the storied naves of the island church. 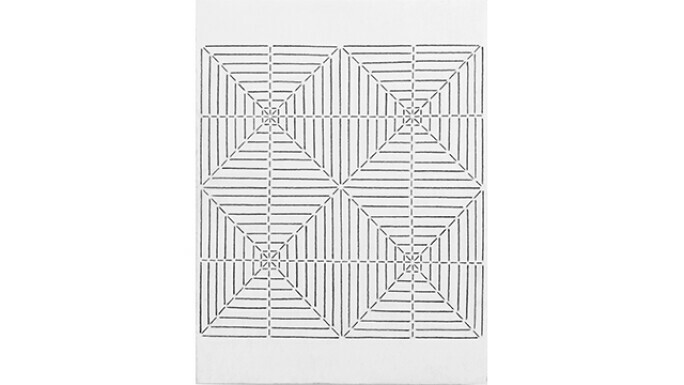 Linda Karshan: Art, Architecture and Sacred Geometry in Conversation, an exhibition featuring the line drawings of contemporary artist Linda Karshan, is a transporting, visual dialogue between the artist and the complex art history of Venice. 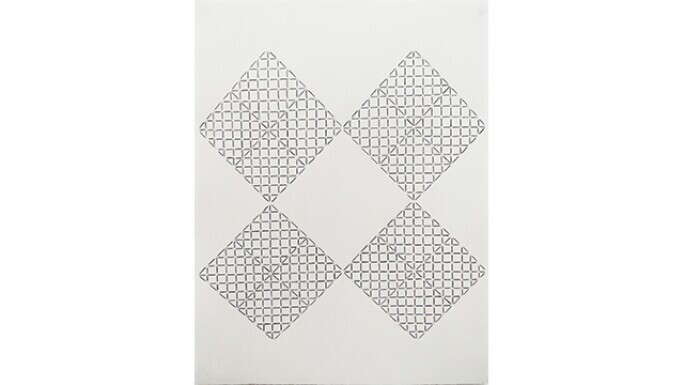 Born in Minneapolis, Minnesota, in 1947, the artist began drawing at the age of four. Today, Karshan's practice is distinguishable in its perceivable simplicity; she meditates the concepts of time and movement through her illustrations of carefully rendered dark lines and shapes intersecting on paper. The fractals of the world are a source of wonder for Karshan and, as a result, the patterns continuously reveal themselves in her art form. Illustration by Linda Karshan, 2014. Image courtesy of artist. Linda in Arabesque. Image courtesy of artist. It is with this exact stance that the artist responds to the artworks found in the permanent collection of San Giorgio Maggiore. Presented alongside Karshan's contemporary drawings is a 15th century manuscript exhibiting many of the same lines and shapes found in the contemporary work. In its display, the manuscript opens to a single page, an act that uncovers an illuminated initial, a carefully formed ornamentation. The gilded paint highlights the deep blue of the initial; a letter that additionally serves as a frame for the precise pattern within. 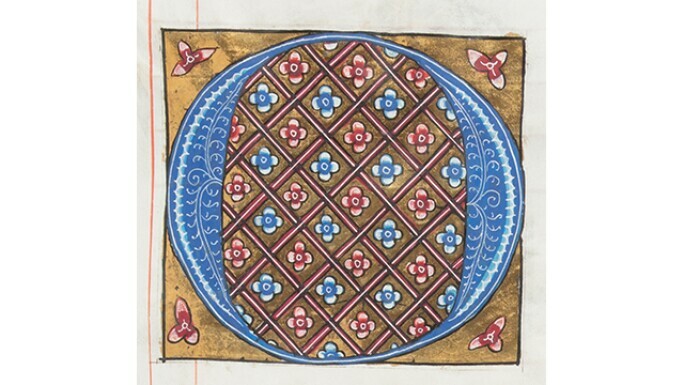 The intersecting lines surround symmetrical floral motifs and, much like Karshan's drawings, the richly decorated manuscript complements organic forms observed from the natural world. Antiphonal Manuscript Detail, 15th century. Image courtesy of artist. Simultaneously, the intricacies present in both the construction of San Giorgio Maggiore and its smaller features, such as the church's decorative windows and patterned floors, are reminiscent of both the 15th century manuscript and Karshan's work. The nave of the Benedictine church is flanked by curved arches and lineal columns, topped by Corinthian capitals influenced by nature. San Giorgio Maggiore's altar holds the monumental, renaissance paintings of famed Venetian artist Tintoretto. All aspects of the exhibition shine light onto the universalities of Venetian art, architecture, and Karshan’s abstractions and contemporary interpretations of local art history. View of Nave in the church of San Giorgio Maggiore. Image courtesy of artist. “Venice is a city in balance,” says curator Richard Davey, “a city traversed by waterways. Making the water crossing to visit San Giorgio requires a similar act of balance that we find in Linda’s work. Balance is a key experience of being in Venice, central to Linda’s working process and the finished compositions of her drawings.” In Linda Karshan: Art, Architecture and Sacred Geometry in Conversation, Karshan succeeds in her quest to find balance on multiple levels - between historic and modern times, between organic and abstracted form, and between Venice and all that lies beyond. Linda Karshan: Art, Architecture and Sacred Geometry in Conversation is on view at the Church of San Giorgio Maggiore through 7 October 2018. Equilibrio: Linda Karshan – Art, Architecture and Sacred Geometry in conversation, limited first edition book.